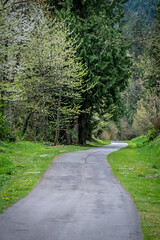 The Preston-Snoqualmie Trail is a 7-mile-long paved route through steep terrain within the Mountains to Sound Greenway. Access points are at High Point Way, Preston Athletic Fields and Community Park, or if you’re just in it for the views, Lake Alice Rd SE. If you park and head eastward from High Point Way, the trail retraces an historic railroad route with gentle grades ideal for walking, running, and bicycling. In Preston, the trestle that had once crossed the Raging River Valley is absent, so a quick detour takes you down to a protected bike lane along the east side of Preston-Fall City Rd SE. Once you cross, you’ll actually head back the way you came and onto SE 68th St, across the Raging River and back onto Preston-Fall City Rd again for about 0.2 miles. There, you’ll encounter a series of gravel switchbacks (I made it up about two of them before relenting to carrying my touring bike), which takes you climbing to the north side of Snoqualmie Ridge. There the paved trail again continues, meandering through secluded woodlands with exceptional views, passes through the parking lot/trailhead at Lake Alice Rd SE (you can find a portable bathroom there as well), and ends at a viewpoint overlooking Snoqualmie Falls. I enjoyed the soft sounds of streams making their way through various culverts, the dappled light filtering through the moss-covered cedar canopy, and the quiet buzz of my tires on the damp asphalt. While the endpoint is a remarkable view, the natural growth of the surrounding forest has been pretty healthy, so the view is better in the fall or winter than in spring or summer. That being said, it was still an amazing sight, and there are three benches and a picnic table to rest on and enjoy a break before you head back. There’s also a portable bathroom at the end if you need it. Next time you’re looking for an pleasant 14-mile, there and back again, ride or hike, check out the Preston-Snoqualmie Trail. You can also find the trail on our TrailFinder page. Find some sun and get out into #YourBigBackyard!